Mick Moor has been erecting tanks and silos for over thirty years, and with Matthew, his son, must have handled millions of silo bolts during this time. We know the importance of good quality bolts and nuts, and the effect this has on the ease of erecting a silo or slurry store. If all bolts tighten fully the first time, there is no need to remember to return to the one that has to be changed, and no need to attract the attention of your colleague inside the silo or tank to change it; no need for him to re-apply mastic to seal the bolt head against the glass surface. All of these are chances of a small mistake much may not be evident until the silo or tank is put to use, requiring a return to site to correct. We have identified the manufacturer of the highest quality silo bolts, nuts and washers, based on our experience and we use their products by choice. We now offer these silo bolts, nuts and washers for sale to the customer who values a quality product at a reasonable price. What is a silo bolt? 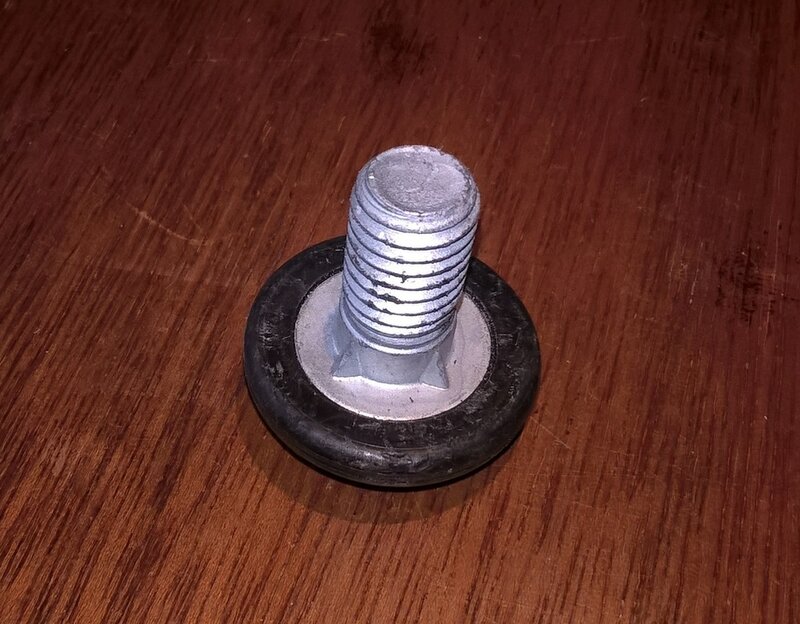 ​To those in the business, this describes a very specific type of bolt, used to bolt the glass fused to steel panels together in silos and slurry stores. ​For some unknown reason, they are not normally known as tank bolts. The technical term is a ‘Cup nibbed bolt’ or a ‘Cup finned bolt’. The nibs (or fins) are small burrs on the junction between the head and the shank, which bite into the glass surface and allow the nut to be tightened without having to hold the bolt head. ​These bolts are also used in bolted tanks for waste liquids, leachate, digesters and digestate. The nuts are usually tightened with an impact wrench (or nut runner). Obviously a spinning bolt could damage the glass coating, so the design of the nibs is important to a correctly performing bolt and a long lived silo or tank. Nuts, bolts and washers are always galvanised. ​The galvanising process has enormous influence on the performance of the bolt when tightening the nut. We choose a manufacturer with the most strictly controlled process, giving bolts which the nut can run freely up the full length of the thread. The thread form is normally ½” UNC, thus the lengths are in inches. The bolt head is encapsulated in plastic for added corrosion resistance. This plastic is safe for food use. When used correctly, these bolts resist strong acids as well as alkalis, covering a pH range from 3 to 10. The plastic cap on the bolt is normally one colour for a certain length, allowing easy identification of the length of bolt used in various positions in the silo or tank; e.g. Black – 1”; Grey 1¼”; Blue 1½”; White 1¾"; Red 2"; Tan 2½"; Yellow 3". ​Other colours are sometimes specified, and can be supplied to special order, (lead time 12 weeks) as can bolts without the plastic cap, or with caps made from alternative materials. ​Galvanised washers are always used under the nuts. Standard size is approximately 1 3/32” OD, 9/16” ID, and 14 gauge thick.